Let’s say for example you are short AUDUSD. If you then get stopped out, do you enter short again but at the higher price or do you skip that trade completely? If you DO re-enter at a higher price, when will that be? When you get some kind of candle confirmation? I re-entered a stopped out trade much higher than the first signal and THAT signal ALSO got stopped out. 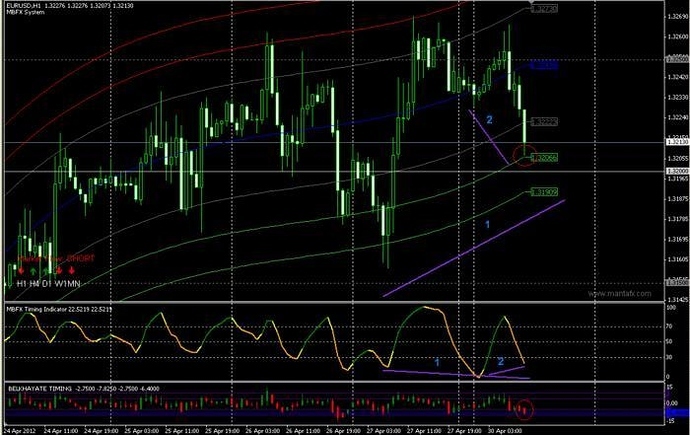 I’m talking about the AUDUSD H4 chart from Friday. Went short, stopped out, went short again 30+ pips above my previous entry and got stopped out AGAIN from that strong move. on range bar charts - no need for timing indicators - just use with confluence of support and resistance/pivots. you will be amazed. if you really need another filter add TMA bands and only trade when price exceeds bands into a extreme COG level. Great idea thanks! I also think that, after a break of supposed resistance like that trade, to wait for some confirmation in the form of candle patterns or something where you can clearly see rejection finally happening, signalling a possible top or bottom. Currently testing moving COG against static COG to see which I like best. Glad to see thread alive here for Belkhayate as seems to have died on FF. CryAgony - what’s your skype name as that one didn’t work. I’m short EURCAD on H4, right at 2nd red line, just look at the Timing indicator’s “overbought” condition! take a look at gbp/jpy. H4-chart. I have been using this system for a while making small profits here and there but there is one thing I dont understand. How do you know when to place a trade? When the trade bar crosses the buy or sell indicators(Red / Green) or only when the bar closes in the indicators? 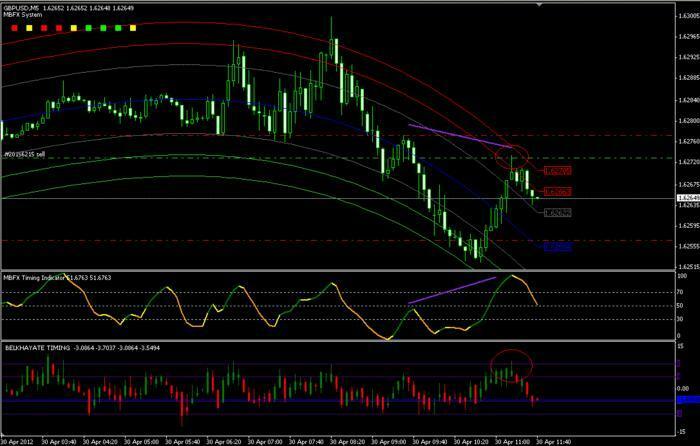 The reason I ask this is I placed a trade on the EUR/USD 1.3225 this evening on TF 5min to sell as all targets for the indicators were met but changed on the following candle and the one there after and eventually the candle I placed the trade on was further out of the “sell zone” as the indicators extended higher 1.3235 and more…What should be done? Thanks again for sharing this, as I said I have had my fair share of profits using this system but just struck out now. I took position AUDUSD at 1.0323 with TP 1.0434 (H4).